Promoting energy efficiency is not just a political concern. It is also becoming more important for the financial success of industrial companies. To improve energy efficiency, it is crucial to audit existing systems, implement optimization measures and then monitor energy consumption on an ongoing basis. EnEffCo® is an energy efficiency monitoring solution that was developed by ÖKOTEC in close collaboration with industry partners. ÖKOTEC’s comprehensive spectrum of supplemental services ensures optimal deployment of the software solution. With an intuitive user interface and a wide range of features including the tracking of energy consumption, the main focus with EnEffCo® is to improve energy efficiency. The software allows you to systematically monitor and analyze energy data, as well as easily generate energy reports. EnEffCo® has a modular design, meaning components can be flexibly added to the basic version of the software to suit your specific needs. A range of supplemental modules are available, offering functionality such as client and site management, conveyor system visualization, and measures management. The EnEffCo® software (version 2.5) has successfully passed the conformity assessment according to DIN EN ISO 50001. The conformity assessment was carried out by an external auditor of the certification company GUTcert. 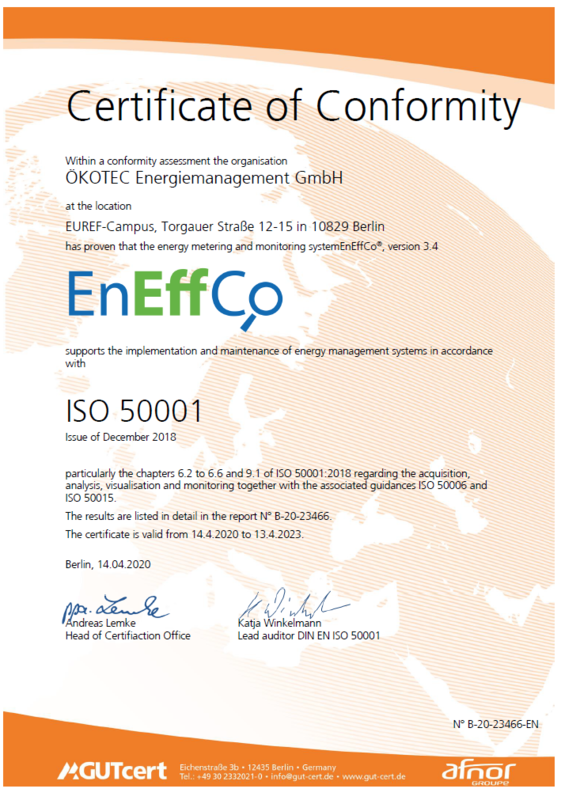 “ÖKOTEC Energiemanagement GmbH has proven in the audit that the EnEffCo® system (frontend version/backend version: 2.5) comprehensively supports the introduction and maintenance of energy management systems according to ISO 50001:2011 and the associated guidelines ISO 50006 and ISO 500015. Effective energy tracking is indispensable for the ongoing improvement of energy efficiency. EnEffCo® is a comprehensive energy management system that can be custom adapted on a modular basis to the specific features of your firm. EnEffCo® fulfills the data management requirements set forth by ISO 50001 and DIN EN ISO 16247 and the norms of ISO 50006 and ISO 50015. Our measures management module enables you to comprehensively manage all measures, including action plans, energy targets, deadlines, budgeting, and task assignments from their initial conception up to follow-up assessment. In addition, internal rates of return, cash flows, and dynamic payback periods can be calculated with a single click. We look forward to showing you how EnEffCo® can improve the energy efficiency of your company while also supporting your bottom line.